This Amish handcrafted hope chest is proudly made in the USA. It is Amish handcrafted out of 100% solid cherry wood. The rounded top and scalloped feet help give this hope chest a classic design that is sure to remain in style for generations. This hope chest is a perfect wedding, graduation, or Christmas gift. 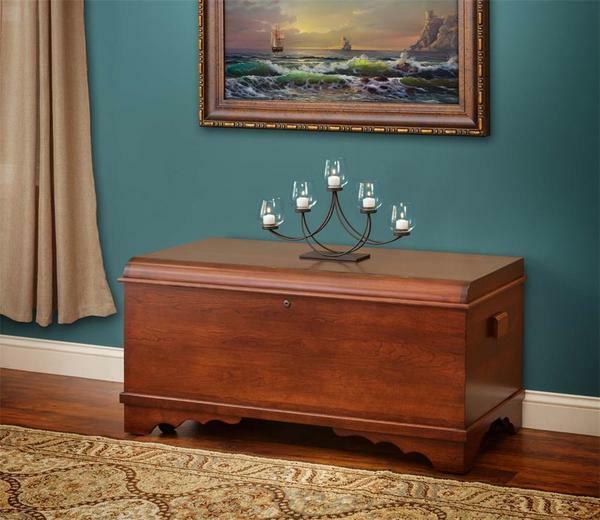 At DutchCrafters, we offer many different options to customize your hope chest. This chest comes standard with a cedar bottom, spring lid support and a functional lock. Our Amish hope chests are sure to become a treasured heirloom item that will be passed on for generations. For any personalized engravings, please note your request at checkout, or place your order and we will call to confirm your personalization. If you select to have a Brass Plate with an engraving, you can expect a call within 24 hours to receive your engraving message. This Brass Plate will be mounted on the inside of the lid unless otherwise specified. Please make any location changes clear in the notes of your order. Call one of our Amish Furniture Specialists today at 866-272-6773 with any questions you have, or for assistance with ordering. Our team of Amish Furniture professionals are here for you - to help you find exactly what you need! Thank you for shopping with DutchCrafters. Brass Plate Engraving - 1 3/4" x 4"
*For any personalized engravings, please note your request at checkout, or place your order and we will call to confirm your personalization.